09. Ocote Soul Sounds - Where Is the Love? 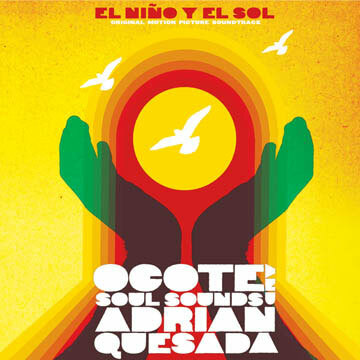 El Niño y el Sol is a collaboration between Martin Perna (Ocote Soul Sounds) and Adrian Quesada. They are founding members of two of the world's most successful and progressive afro/latin/funk big bands, Antibalas and Grupo Fantasma, respectively. Antibalas (Brooklyn, NY) has been credited with reviving the afrobeat sound popularized by Fela Kuti. Grupo Fantasma (Austin, TX) has been called "the adventurous musical offspring of Los Lobos and Mano Negra". In winter of 2004 Martin Perna embarked on a eco-utopian roadtrip involving a Mercedez-Benz running of vegetable oil from Brooklyn, NY to Michoacan, Mexico. On his way back to Brooklyn, the car broke down around Austin, TX where he stayed for over two weeks at the home of Adrian Quesada. It was a matter of days before they realized they should take advantage of the time and record at Adrian's home studio, Level One Studios. They began to work on ideas using minimal equipment, including an MPC 2000, flute, guitar, bass, keyboards and percussion and the groundwork was laid for El Niño y El Sol. The result would begin to blur the boundaries of the music that inspired them-soul, funk, afro-latin music, hip hop and movie scores. Some songs were based off instrumental hip hop tracks, others were recorded entirely live. To round out the album, a few songs recorded over 2 years ago by Ocote Soul Sounds in NYC were added. Among them is "Divinorum" which has been released as a 45 on legendary NYC DJ Bobbito's Fruitmeat label and has been a hit at DJ Rich Medina's afrobeat parties. Another hard hitter called "Dedication TV" had been written and recorded over a year before by Adrian Quesada based on a sample of Martin's flute from their 2003 sessions! The music was then compiled and sequenced together in 2004 to complete the album. El Niño y El Sol is a unique collaboration - a ficticious soundtrack to a movie about a young boy trying to get to the sun, a document of a specific moment in time and of two musical contemporaries joining forces to create beautiful instrumental music. Martin and Adrian will continue their busy schedules with Antibalas and Grupo Fantasma. The album will be availalbe all both bands' live shows and will be distributed through Groove Distribution. Ocote Soul Sounds is a group that is sometimes a solo project and sometimes a full-on group. Lately, I've been working alone on two records, "Electric Tides" (June 2005) and "June Tunes (forthcoming Sept. 2005). Together with Adrian Quesada of Grupo Fantasma and Nick Movshon and El Michels of Soul Fire, I made a record called "El Niño y El Sol", which is more of a psychedelic and eclectic latin funk sound with mostly live instrumentation. Adrian and I have another one in the works, hopefully to be done by the end of 2005.